This analysis of Canadian foreign policy was presented to Russian audiences on the state TV channel Rossiya 1 last Sunday, 13 January. The report inscribes itself in Russian state media’s long-term campaign to misrepresent and denigrate Ukraine and its allies. At the same time, the story is an example of the tendency in pro-Kremlin media to portray international criticism of Russia as irrational and the result of conspiracies. Even if Rossiya 1’s report is at first glance about Canada, it quickly becomes clear that the main aim is to talk about Ukraine. The item opens by showing a cemetery in Canada with the gravestones of Ukrainian soldiers who fought Soviet troops alongside Waffen-SS during World War 2. 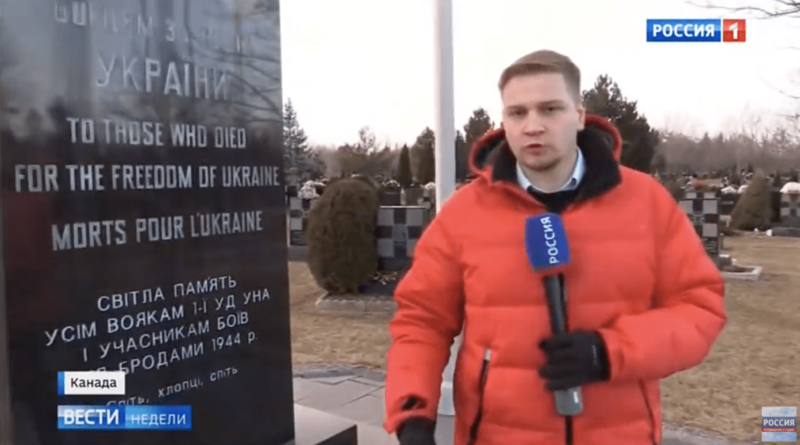 Rossiya 1’s reporter at a Canadian cemetery with gravestones of Ukrainian soldiers. This sets a tone of guilt by association and allows Rossiya 1 to present a number of Canadian politicians of Ukrainian descent, including foreign minister Chrystia Freeland, as suspicious, for example when they appear in public wearing traditional Ukrainian clothing, the vyshyvanka. Presenting Ukrainians as Nazis stands centrally in the attacks on Ukraine that target Russian audiences so that they view Ukraine as an acceptable target of Russian military aggression. The TV report presents the Canadian government’s critical stance towards Russia as simply the result of Ukrainian nationalism. This is typical of pro-Kremlin disinformation: We often see Russian state media seeking to portray criticism of the Kremlin as irrational – the result of “Russophobia” – and part of a conspiracy. This framing makes it unnecessary to show the real reasons why Canada and other members of the international community have e.g. imposed sanctions on Russia, namely the Kremlin’s aggressive policies towards Ukraine. Rossiya 1 supports this narrative with a classical propaganda trick. The TV channel invites an expert to explain the role played by descendants of Ukrainian immigrants in Canadian politics. Canada’s national public broadcaster, CBC, produced a news story about Rossiya 1’s report. The commentator, who speaks fluent Russian, is presented as simply “Irina Bronnikova, a resident of Toronto”; however, Canada’s national public broadcaster, CBC, identified her as “director of the Russian Congress of Canada, a group seen as being very pro-President Vladimir Putin”. The Rossiya 1 report from Canada was introduced by the weekly show’s host, Dmitry Kiselyov, who has been personally sanctioned both by the EU and by Canada for his role in the government propaganda supporting the deployment of Russian forces in Ukraine. 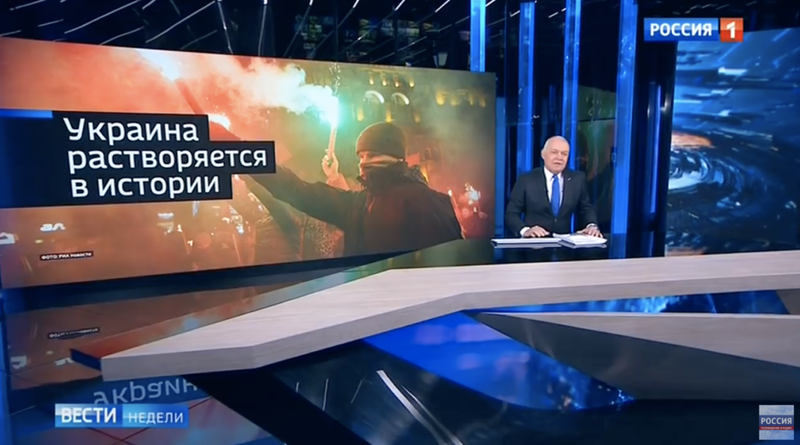 “Ukraine disappearing in history,” says the sign behind Rossiya 1’s news host, Dmitry Kiselyov. The program was aired just two days before official Moscow stepped up its threats against Ukraine, which this time suggested that Ukraine could soon cease to exist a country.